There’s no doubt that you’ve heard about the Equifax breach by now, and for good reason. It’s a really big deal. The trouble is, when something is a big deal, everyone reports on it. Instead of just reading one article on the matter, you’re faced with tens or even hundreds of articles, all of which offer different bits of advice. Here at InHomeSafetyGuide, we want to help you keep your identity safe, which means helping you sift through the information and make sense of it all. Here are the important things to keep in mind about the Equifax breach so you don’t have to go on a wild goose chase all over the internet. What exactly is the Equifax breach? 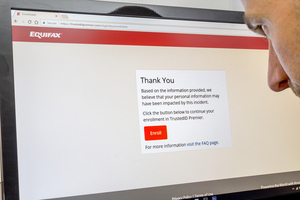 Equifax, one of the three main credit bureaus that houses important information like addresses, credit accounts, and social security numbers, experienced a hack sometime between mid-May and July, potentially putting 143 million Americans at risk of identity theft now and in the future. Believe it or not, but even with numbers like that, the Equifax breach isn’t the biggest hack in history. However, it’s being labeled as the worst. That’s because, instead of emails and messages being hacked, identifying personal information can be accessed that provides identity thieves with all kinds of ways to use your info. What really makes the breach frustrating to consumers is that we have no control of our involvement with Equifax. It’s not like we can be mad, like we could about the Target fiasco, and refuse to shop there again. At least we could pinpoint which credit cards may have been compromised since a single location was hacked. Do you know what’s on your Equifax score? It could really be anything from your entire credit history. If you end up a victim of the hack, you will have no way of stopping it, identifying it will be difficult, and you can’t just pull the plug on Equifax. They will continue to monitor your credit. That doesn’t even account for all the people who don’t even know what Equifax is, so they have no idea that their information could have been compromised. Before you get too worked up, there are a few other numbers you should know. Although 143 million people’s personal information may have been compromised, it looks like there may only be 209,000 credit card numbers that were compromised, and 182,000 people’s personal identifying information that may have been compromised. That’s a little less scary than over 100 million, but it is unclear exactly what that means. At the end of the day your information could end up in the wrong hands, and that’s enough to make anyone toss and turn at night. We mentioned earlier that you can’t just pull the plug on your relationship with Equifax. So, what can you do about it? This is where things get really frustrating. You can start by testing to see if your information was potentially impacted. Just click here. And keep in mind we’re talking about a potential problem, not a bona fide, real problem. Then, you’ll want to keep in mind that it may not tell you anything at all. Some people have been inserting fake information into the search and discovering that their made-up account has been hacked too. Even though Equifax really dropped the ball, and we’ll talk about that more in a minute, they are offering free credit monitoring for one year through their TrustID Premier program. They’re offering this service whether you were potentially affected by the hack or not. They’re also planning to send letters to those people who were directly impacted by having their credit card numbers or important personal information stolen, but it’s unclear when you could expect that letter to show up in the mail. If you really want to lock down your information, a credit freeze is probably the best option. But, because there are so many people who are being potentially impacted by the breach, it’s never been more popular to freeze your credit. It may take you a bit longer to put a freeze on your account as the credit bureaus deal with higher volumes of requests than they’ve ever had to deal with before. How could Equifax let this happen? You would expect a mammoth agency like Equifax to have this sort of thing figured out before it becomes a problem. So, how in the world could they let this happen? It looks like the breach can be attributed to Apache Struts, which is a free, open-source software platform that is used to create Java web applications. It looks like there have been multiple issues, which since have all been resolved, but we don’t which one is causing millions of Americans all this grief. We won’t go into all the details, but it does raise some interesting questions. You can learn more about all that here. What’s even worse is what appears to have happened after the breach was discovered. The announcement wasn’t made until September 7, 2017, after discovering the problem on July 29, providing investors with the chance to dump stocks leading up the announcement. It certainly makes it look like something fishy is going on. Add to that the way Equifax has dealt with the issue since it has been announced and consumers have even more reason to be frustrated. Initially, Equifax was charging for credit freezes. Fortunately, they’re refunding that money and freezes moving forward are free, but that’s salt in the wound to those of us who were on the ball and froze our accounts as quickly as possible. Their TrustID Premier program is free, which is a good step, but Equifax is also trying to protect themselves from future lawsuits. When they initially offered free credit monitoring, it included a provision that barred those who signed up from suing them. Fortunately, that stipulation has since been removed. What’s being done about the breach itself? Stuff like this just can’t happen. As consumers, we deserve to know that our personal information is being protected. So, what’s being done to make sure this doesn’t happen again? It’s hard to say exactly how Equifax will weather the storm, but if the government has anything to say about it, they aren’t likely to weather it very well. Sen. Elizabeth Warren (D-MA) is demanding a thorough government investigation of the breach, and she introduced a bill that would prevent agencies from making a profit on report freezes and credit monitoring for breaches in the future. Unfortunately, all that’s being done about the breach isn’t good. There are plenty of scammers out there who are trying to make a bad situation even worse, so make sure you don’t fall into their traps. There’s a ton of information out there about the Equifax breach, and we’ll only hear more about it in the coming weeks and months. If you’d like to learn a bit more, click here for answers to commonly asked consumer questions that are only just now being answered, or you can learn more directly from Equifax here.